Villas at the Boardwalk - Watch the Boardwalk Activity and the Ocean too! Our family rented a 3-bedroom condo at Villas at the Boardwalk for a week in June of 2006. It is a newer resort built as Timeshare Condos, and not a Hotel conversion. The unit was fairly roomy, had a full kitchen, and a great balcony view of the Virginia Beach Boardwalk activity, the Pier, and the Ocean Waves. Our 3 teenagers loved the location since it was close to the Virginia Beach Pier activity and near where some of the outdoor bands set up many evenings. My husband and I preferred to "People watch" the Boardwalk and beach activity from the condo balcony with the ocean waves in the background. The beach or Boardwalk never got really crowded. Our only complaint with the unit was that the air conditioning was a "through-the-wall" motel style, that was more noisy than a regular central air unit is. Plus the unit blocked part of the beach view from the living room. Otherwise, everything worked fine and we enjoyed our stay. 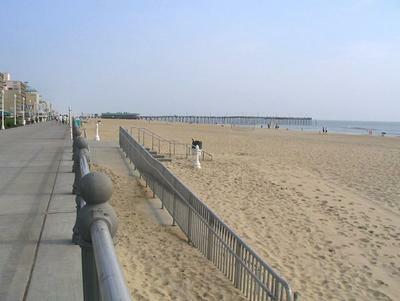 With teenagers, Virginia Beach is a good family vacation, lots to do on the boardwalk with the bicycle path, etc, plus a wide beach area. We took day trips up to Yorktown Battlefield, Colonial Williamsburg and Busch Gardens which are only a little over an hour drive away. Tip - leave after the morning rush hour and wait to return after the afternoon rush traffic period through "the tunnel." Our Family really enjoyed Virginia Beach. We would give the Villas at the Boardwalk a 5/5 star rating. Comments for Villas at the Boardwalk - Watch the Boardwalk Activity and the Ocean too! Thanks for the Info about about your Family's experiences at the Villas at the Boardwalk. Sounds like the location near the Pier worked out well for you near the heart of the action on the Boardwalk. My wife and I hope to be able to exchange into this resort on our next trip to Virginia Beach. It is a "Sister" resort to the Clarion and we took them up on their offer of a $30 Restaurant Certificate if you went up and listened to a presentation and did a tour. Looked like a nice place to stay. We also noticed the Air Conditioners through the wall you mentioned, plus that some of the 1-bedroom units did not face the ocean. Have to be sure what you are getting if are requesting a 1 bedroom. Think that all of 2 and 3 bedroom units faced the ocean. Join in and write your own page! It's easy to do. How? Simply click here to return to Virginia Beach Time Share Rental Raves, Rants, and Reviews.